This post is sponsored by Everywhere Agency on behalf of Sistema®, however all opinions, thoughts and motherhood skills are my own. We've officially hit the time of year where the internets will be all aflame over the newest batch of viral lunch box videos. And you know the videos I mean - they feature adorable, complex, incredibly timely lunchbox creations that send a regular mom sprinting to Pinterest in search of the best way to shape carrots into flowers and sandwiches into windmills. I'm going to go right ahead and share that I am not the sandwich windmill kind of mom. 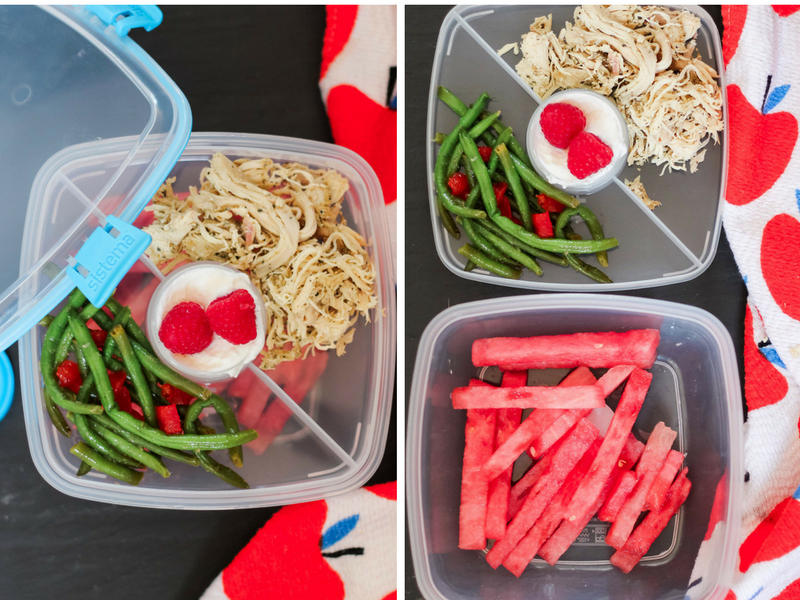 I'm a "let's figure out a balanced, well packed lunch that will keep you full and not make me hate myself every single time I pack it" kind of mom. And let me be clear, if you do love to make flower shaped carrot dippers, then rock out mama, no judgement, I just can't hang. So what's a regular mom to do with the school year fast approaching? This year, I've decided that I'm going to meal prep lunch boxes in an effort to cut down on morning stress and to save a little in our grocery budget, too. 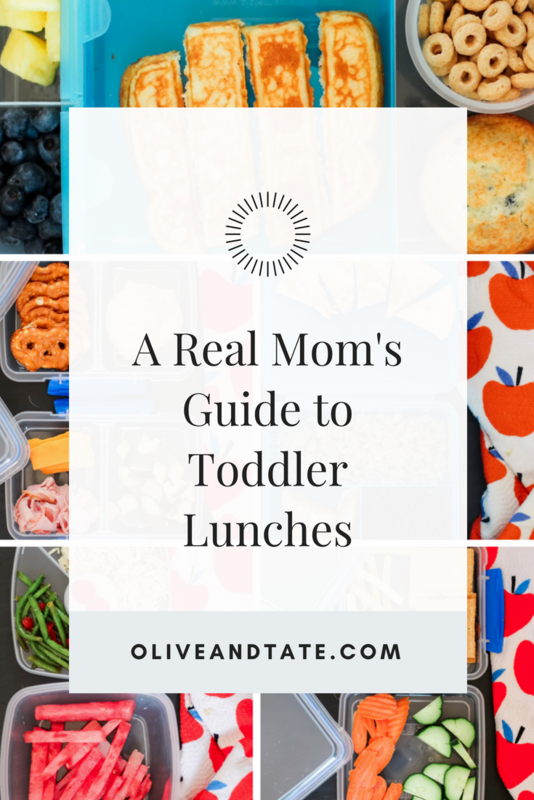 I sat down this weekend and whipped up 5 perfect lunches, all geared toward my toddler (but that are perfect for all ages, just adjust the portions accordingly). I stocked up on all of the gear I need, thanks to the Sistema® To Go options and, bonus, shopped it all on sale via my truest love: Amazon. With a variety of sizes, shapes and containers, I'm all set to whip up a weeks worth of lunches in just 20 minutes. Wanna see what I made? Ah, leftovers. The trick to this little lunch number is to utilize what you've already got on hand - let's face it, if you made it for dinner once, you probably have at least one kid who refused to eat it, so box it up in a Sistema® To Go Salad Container and pass it along to the hungry toddler in your life. This box consists of the perfect dividers to include both watermelon (super runny/sticky) and Greek yogurt without making the rest of the good soggy. As a heads up, if you have an adult in your life who doesn't like their foods to touch, go ahead and get them one of these and thank me later. In all seriousness, I tend to grab a rotisserie chicken from the deli on our grocery run, shred it up when I get home and use it throughout the week (you'll see it again in another lunch below). Paired with green beans, which hold up well when re-heated, you've got the basics of well balanced lunch. A Mexican style boxed literally could not be easier to whip up - just use one small tortilla filled with cheese and shredded rotisserie chicken and pair with rice and beans. All of the elements can be made well ahead of time and stored in the Sistema® Lunch Box. The Lunch Box has a built in compartment meant to keep a sandwich separated and fresh and it fits a petite (or full sized) quesadilla perfectly. If your family doesn't do beans, swap them out for corn! Will anyone else's toddler eat anything if they can "dip it"? We are big fans of hummus around here because I call it "dip" and I assume my kids think it's a cousin to Ranch dressing based on the way they scarf it down. 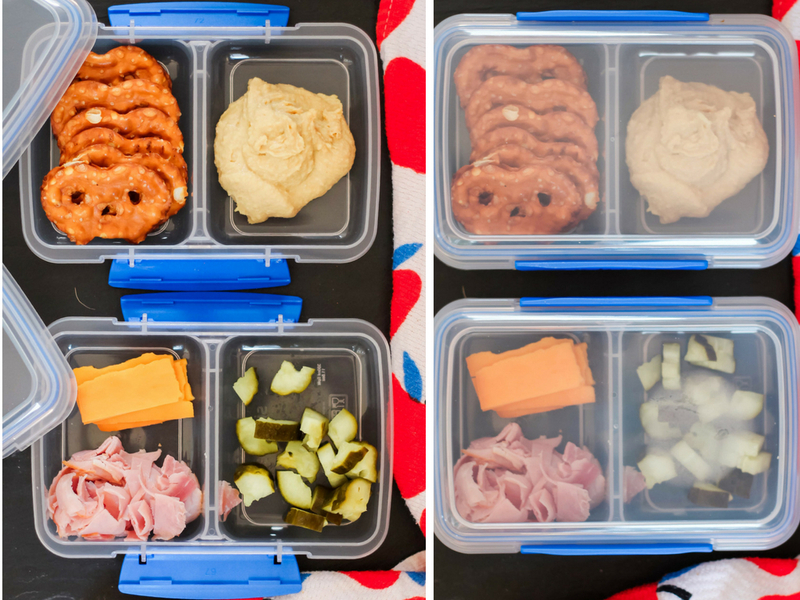 With cold cuts and zero elements to cook, this is the easiest of all of the lunches to prepare and toddler sized portions fit perfectly in the Split Food Container. The center dividers keeps the hummus in place and the pickle juice away from the deli goods. Everyone loves breakfast for dinner, so why not breakfast for lunch? This is the only lunch that I plan to cook an element the day of - and by "cook" I mean "pop in the toaster". 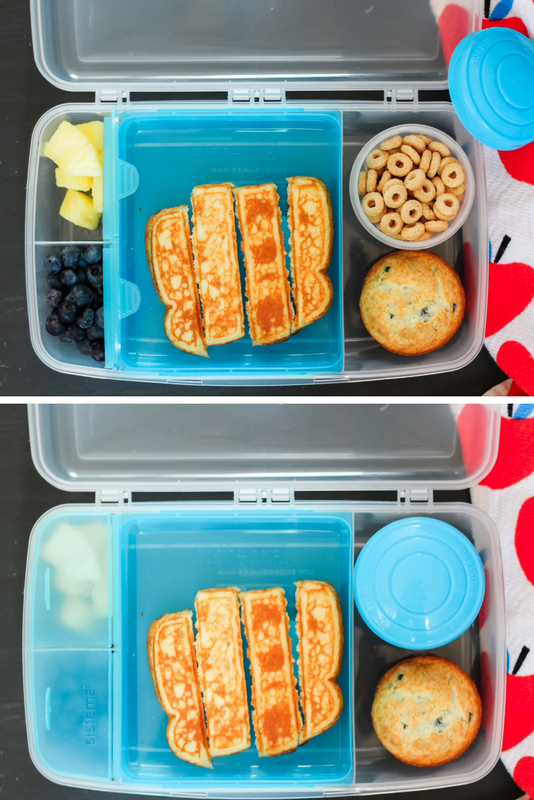 I pair homemade blueberry muffins with toaster french toast sticks, load them with fruits and Cheerios into the Large Bento Box and call it a win! 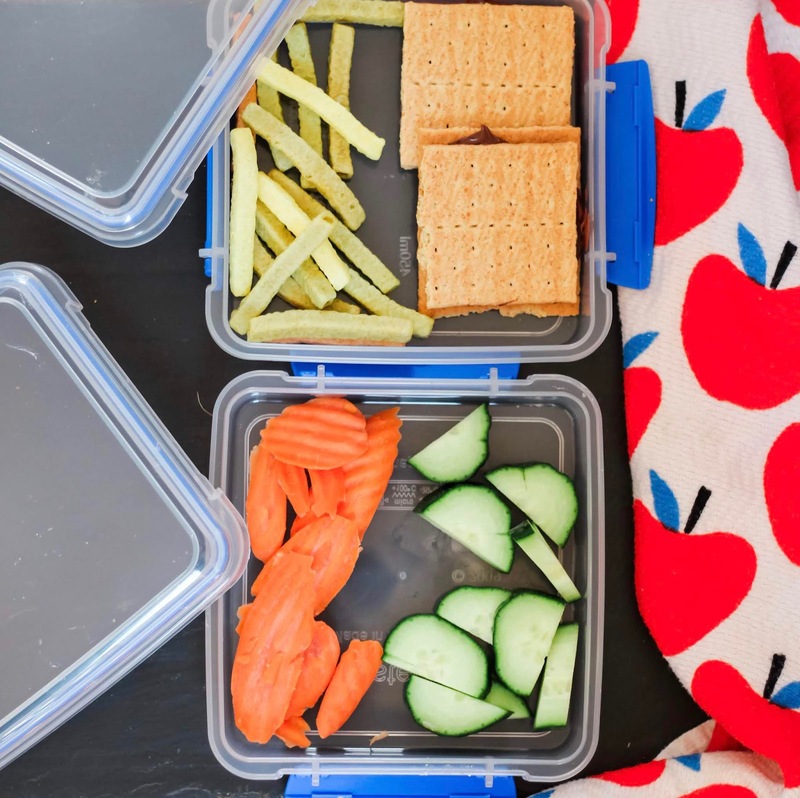 For the most basic palette's in the bunch (otherwise known as "what I pack my son every single day), I stack two Sistema® Sandwich Boxes with Nutella and Graham Cracker sammies, pre-chopped veggies and a lunch time classic, Veggie Straws. Look at al of the goodness, packed up and ready to go, stacked neatly in my fridge. Honestly, I don't want to brag, but I really think of all this prep, forethought and nutritional goodness deserves a glass of wine and a Mom Of The Year medal. Now go forth and own those lunches, friends! These are some great ideas! 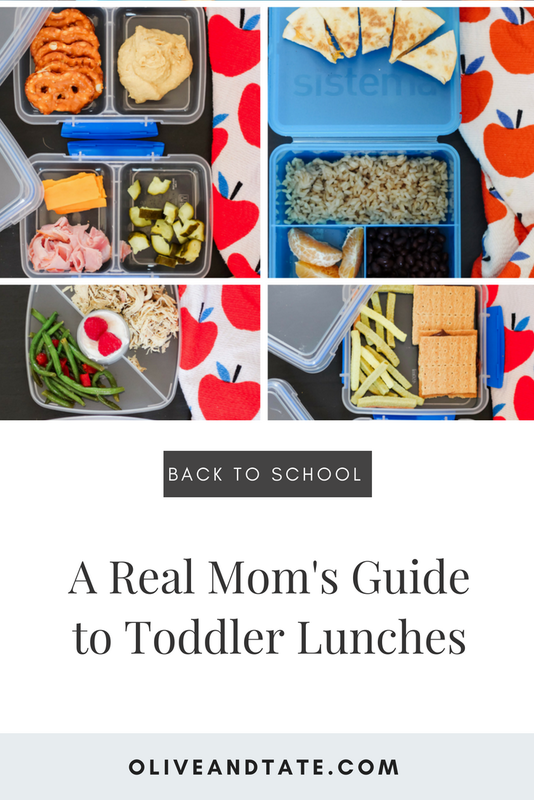 I am always looking for fresh toddler/preschooler meal ideas, especially when it comes to lunch, which I feel is the toughest. I'm the mom that starts off with a bang on packing lunches and then slowly limps to the end of the year, scraping ideas together. Lunches are the hardest! So do I! And the "adult sized" options are really perfect for a tiny lunch box! These are awesome, Stephanie! Already pinned!